Join us for an exciting evening full of laughter, fun, and trendy eats from 7:00 PM to 10:00 PM on Saturday, April 13, 2019, in Chicago. The event will start at 7:00 PM sharp and hors-d’oeuvres will be served. 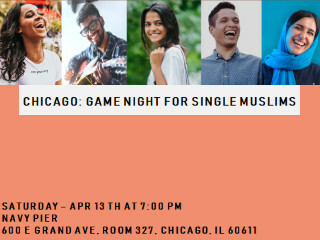 Your game night ticket includes a FREE I Heart Halal ticket. Use the promo code: beyondchai on the festival ticket page! Our previous events have sold out well before the event date so do not miss this opportunity! To continue the fun and reconnect with those from the game night and meet more new people, join us for a lovely brunch on Sunday, April 14, 2019, from 12:00 PM to 2:00 PM. Enjoy an afternoon of engaging conversations and great company. Add on the brunch ticket with your game night ticket for only $15!